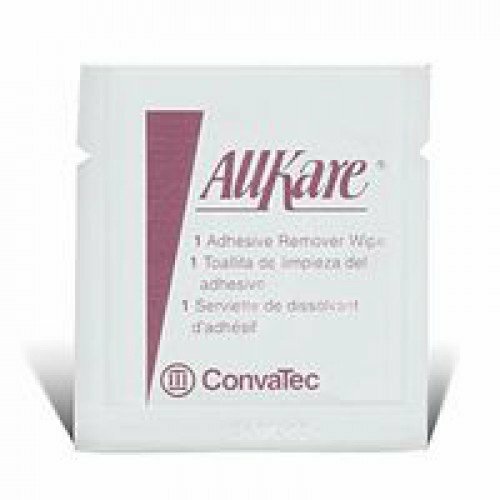 AllKare Adhesive Remover Wipe, manufactured by ConvaTec, is a non-irritating protective barrier wipe that provides a film layer between the integument and tapes, skin barriers, adhesive and hydrocolloid dressings. This protective barrier wipe protects your skin against irritation, stripping of skin, and build-up of adhesive. AllKare Adhesive Remover Wipe, additionally, will gently and effectively remove all adhesives against the skin, including skin barriers, tapes, and hydrocolloid dressings. If you prefer an adhesive remover in a spray form instead of a wipe, make sure to order this comparable and just as effective adhesive remover, SensiCare Sting Free Adhesive Remover Spray, here. Additionally, if you prefer a powder form as a skin barrier, order the ConvaTec Stomahesive Protective Powder, too. Order now and protect your skin against abrasions today! Creates a film layer between your skin and adhesive. Does not contain isopropyl alcohol. Product Numbers: 037443 and 037436. Application: To remove adhesives and create a film layer between your skin and adhesion. Have everything that I need. Very easy to find the right products. I use this product exclusively! AllKare Adhesive Remover Wipes is an extraordinary tool in my personal care kit. Since introduced to me 15 years ago, I use it exclusively. I am confident using this product and trust its reliability every time. I would highly recommend its use to all requiring this type of care. My order was processed efficiently, and the product completely removes all medical adhesive without irritation or stain. Great product! A great product. Really removes the adhesive well without chemicals. Thank you! Since I started working at the hospital, I always see this. They said it a necessity. There are times that patients complain that they have stickies on their finger, left by adhesive tapes and they don't like it. So, to avoid these complaints, we always have pieces of these in our pockets. In case we need to get new blood samples, we automatically remove the tapes from their other fingers and then we use the adhesive left using these wipes.